The Ukrainian Premier League resumes following a two-week break. For the first time in history, it is held in a new format, with the teams being divided into two groups of six and the 23rd round kicking off the competition’s second stage. Shakhtar are the undisputed leader enjoying 14-point gap between the second spot team. The Orange-and-Blacks are to confirm their status in the title race in ten rounds to come (two fixtures versus each of five contenders). Since March 27, Paulo Fonseca’s men have been purposefully preparing for the clash against Zorya at Sviatoshyn training facility. Zorya have a chance to vie for second spot. Yurii Vernydub’s team is lagging behind Dynamo by six points, while they have the same advantage on points over Olimpik. After the winter break, the Luhansk side held four league fixtures: they suffered a loss to Dynamo and Shakhtar by the same score (1-2), defeated Vorskla (2-1) and Volyn (1-0). Hosts’ status promises to be an additional motivating factor for Zorya. Interestingly, the season’s start saw Yurii Vernydub’s lads claiming a seven-match unbeaten run in Zaporizhzhya, however they suffered four losses in a row in nominally home encounters (with the latest loss in Kharkiv). The league contenders held 30 matches in total. 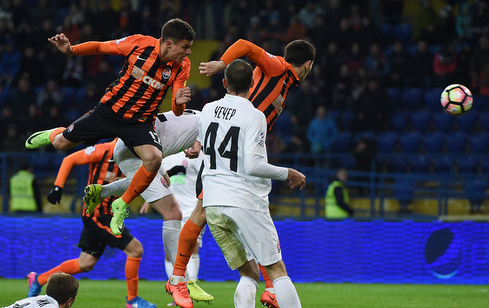 Shakhtar secured 26 wins, as Zorya came victorious 4 times. The goal difference is 80-16. 15 fixtures took place on the pitch of the Luhansk team: +14 = 0-1 45-8. Just three weeks have passed since their latest encounter. In Kharkiv, Shakhtar claimed a 2-1 win. Paulo Fonseca’s men opened the scoring in the 26th minute: Bernard nodded his header into the net following a cross from Marlos. After the hour mark, Kharatin levelled the scoring, but the Pitmen, who created many moments of danger, stole a victory towards the end of the match, with Malyshev cleverly nodding home a corner from Srna. The goal-scoring streak of the Orange-and-Blacks in the league started on August 28, 2015 and lasts 42 games (113 goals). Maksym Malyshev can make his 60th appearance for Shakhtar, with Bernard and Dario Srna being able to register their 120th and 520th outings respectively. Argentines Facundo Ferreyra (with 9 goals under his belt) and Gustavo Blanco Leschuk (with the tally of 8 goals) have a chance to sidestep Junior Moraes from Dynamo (10 goals), who is supposed to play the rest of the season in China, in the top scorer award race.